Now that you’ve chosen the perfect flooring for your home, you may be wondering what exactly happens next. Having a better understanding of what follows can help you properly prepare for the most important part of your flooring purchase, the installation of your wood flooring. Before any work begins, the installer will typically visit your home to inspect the job site and measure the flooring area. Feel free to ask any questions concerning the installation process including how long the process may take! In general, once the project has begun, every room in which a flooring installation will be taking place should be off limits to anyone until the installation is complete. Regardless of your installer’s estimation, there is always the possibility of unforeseen problems so make sure you build in an extra few days into your time table. All flooring needs to acclimate to your home before it is installed. This means it will need to rest somewhere, usually in an unused room, for several days while it adjusts to the temperature and moisture conditions of your home. This is crucial to insuring the proper installation of your wood and one of the most critical steps in the installation process. You should still expect a small amount of dust to collect as the flooring is installed. 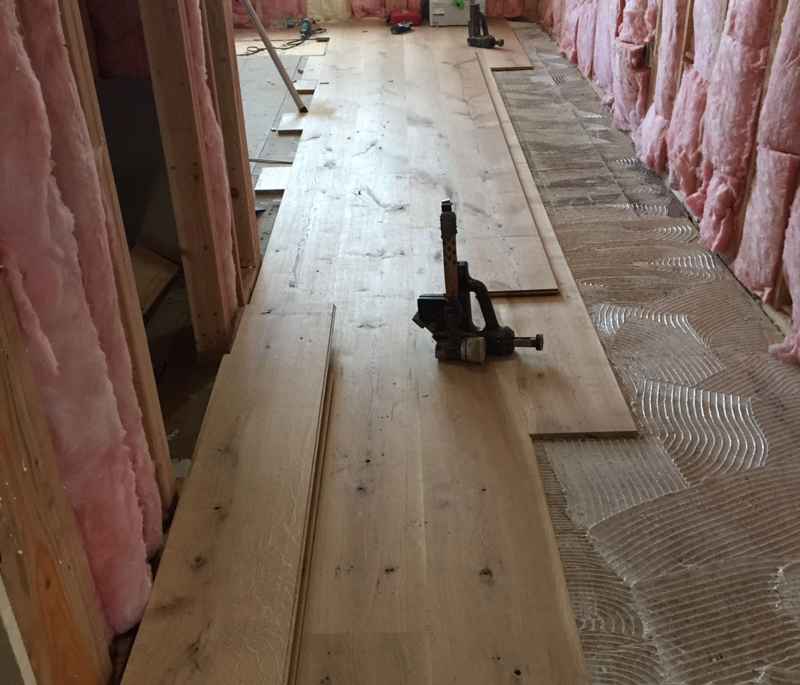 If there are any issues with your subfloor, they will need to be dealt with at this point before the installation can continue. Once the work is complete your installer may advise you to stay off your newly installed floors for a small amount of time to allow any adhesives that might have been used to set. As you move your furniture back into your newly resurfaced room, it might be a good time to consider felt or rubber pads on the bottom of any furniture that will come in direct contact with your new floors. This will help minimize any scratches or dents that may occur. It is also a good idea to test any appliances that were moved during the installation process to insure there are not leaks or electrical problems. After all, you don’t want to risk damaging your beautiful new floors!